These Brownie Batter Protein Balls are perfect for a quick pre/post gym bite, on-the-go snacking or healthy fuel to keep you energized for hours while hiking, biking or simply spending time in the great outdoors. Summer is over. The DefineYOU Retreat has come and gone. And the days are getting shorter and shorter. I’m far from a fan of the colder weather and darker days, but what it does give me is more time to work on sharing some of the content I have created for you a bit more regularly on the blog… did anyone notice my last post was way back on July 1st, over 3 months ago?! When they tell you this blogging life isn’t easy, there’s no doubt about that but it’s totally worth it when someone tries your recipe and then reaches out to say how much they loved it! Although I’ve been posting a lot less regularly lately, I still feel pretty good about where this platform has brought me thus far. I’ve learned that it’s ok to not post on Instagram when there isn’t time. I’ve learned that the followers of this platform who are following for the right reasons won’t get pissed when I don’t share a new blog for >3months. I’ve learned that it’s ok to recognize that I need a break and then openly admit it to others. I’ve learned that even when I’m away, this platform is always on my mind and I’m constantly brainstorming new ideas and events that I can bring to the table. Fun as it’s been, I’m more than ready to get back to the forward facing side of the blog and with that, let’s dive right in to my latest recipe post! 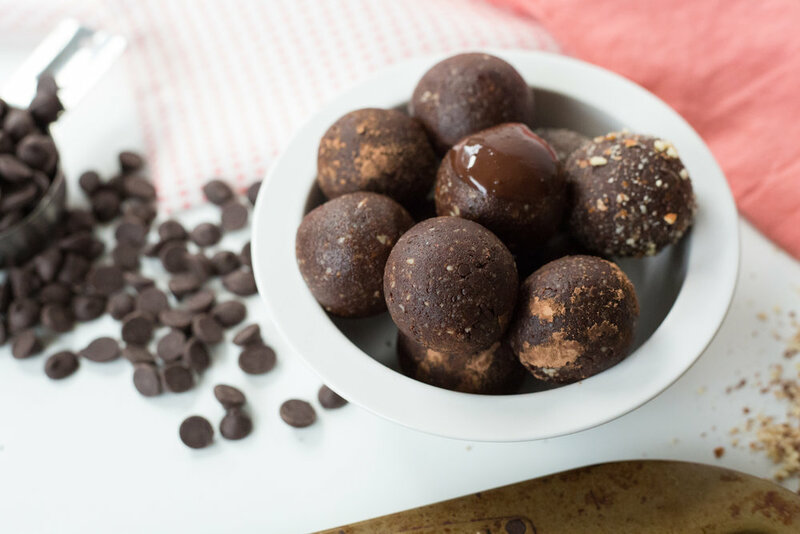 These Brownie Batter Protein Balls are perfect for a pre/post gym bite, on-the-go snacking or healthy fuel to keep you energized for hours while hiking, biking or simply spending time in the great outdoors. Add all ingredients except the dates to a food processor. Begin to blend them together and then slowly, one at a time, start to add the dates to the food processor. Blend until you get a dough-like consistency. Then begin to roll the dough into golf ball sized balls. Place the balls on a lined baking sheet, in a glass pyrex or in any other freezer safe container. Allow them to cool 1 hour before transferring to a bag or any other container where they might touch each other. Have you ever blogged? Have you ever thought about starting a blog? If so, what would it be about? If not, what’s your preferred method of releasing your inner creativity? P.S. Looking for more protein ball recipes? Try my cranberry walnut energy balls or my apricot vanilla energy balls, both are absolutely to die for. P.P.S. Follow along with me on Facebook//Instagram//Twitter//Pinterest to ensure you don’t miss out on healthy recipes, workouts, and daily inspiration. Subscribe to Define Fettle for FREE recipes + workouts! Follow me on IG @definefettle! New groups for the 21-DSD start the first Monday of every month. 5 tips for ensuring your smoothies will taste great & keep you fueled for hours instead of just sending your blood sugar through the roof. Decreased bloating, increased energy levels, improved digestion, brightened skin, less cravings and so much more. I’m not a doctor, but if you think about the ingredients that are used to make this ‘potion,’ there is no doubt that with consistent use of these shots, you are bound to see improvements in your daily life. Beginner or pro, young or old, once a month or once a week… this bedtime yoga routine is a sure way to physically and mentally slow down and start to prepare your body for a good night of rest.